These moist and rich chocolate donuts are kissed with mint and covered in the most decadent ganache. These baked donuts are an easy one bowl treat you can whip up in no time flat. Plus I love the festive crushed candy cane sprinkled on top. 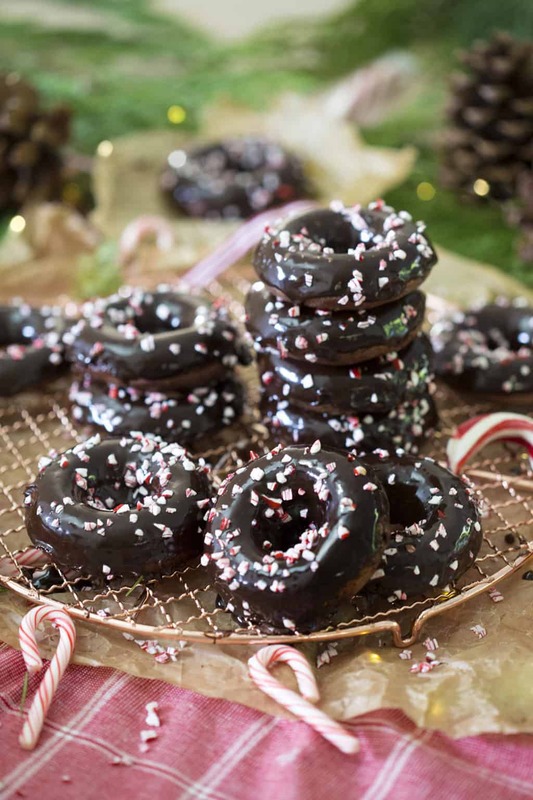 I LOVE these chocolate peppermint donuts! They’re so tender and just perfectly sweet. You’ll definitely be eating more than one! I really enjoyed how the crushed candy cane melts in the oven and forms these ultra-moist pockets of minty goo. I might not be doing it justice in my description. Make sure you add your crushed candy candy into the batter at the very end. It melts fast! This recipe is GREAT with toasted walnuts in place of the candy cane for all you who a re not peppermint fans. Keep a close eye on those donuts. They bake FAST and you don’t want to over cook them. You can also make the ganache by scalding the cream (hot but not boiling) and pouring that over the chopped chocolate. Cover then whisk together after a few minutes. You can zap it in the microwave for 15 seconds at 50% power if there’s a bit of unmelted chocolate left over. 1. Preheat oven to 325 degrees F. Butter and flour the donut pan, In a medium bowl, sift together all the dry ingredients including the sugar Whisk together to make sure all the ingredients are distributed evenly. 2. In a separate bowl add the wet ingredients and whisk together. 3. Pour wet into dry. Whisk until combined. Stir in the crushed candy cane at the very end. 4. Pipe the batter into your prepared pan. Bake for 10 to 14 minutes or until a toothpick comes out clean. Allow to cool on a rack. 5. For the Ganache Add the cream, chocolate and peppermint extract to a double boiler and heat until melted. 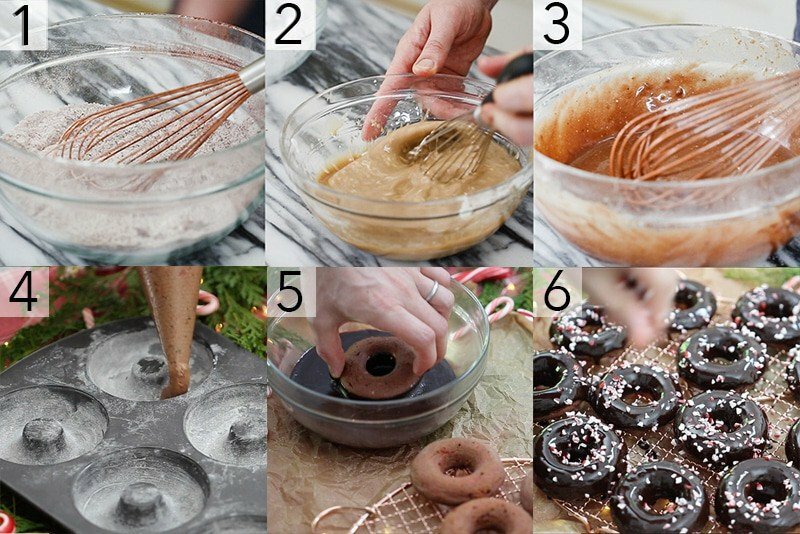 Whisk and set aside to cool then dip donuts and transfer to a cooling rack. 6. Sprinkle with the crushed candy cane and ENJOY!. Rich baked chocolate donuts covered in a decadent ganache with a kiss of mint. Give the dry ingredients a whisk. In a separate bowl add the wet ingredients. Pour wet into dry. Whisk until combined. Stir in the crushed candy cane at the very end. Pipe the batter into your prepared pan. Bake for 10 to 14 minutes or until a toothpick comes out clean. Allow to cool on a rack. Add the cream, chocolate and peppermint extract to a double boiler and heat until melted. Whisk and set aside to cool. 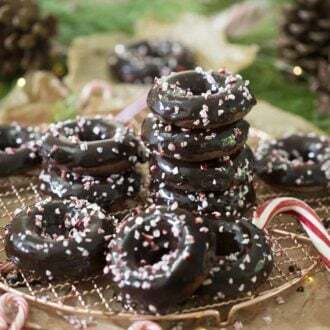 Once the donuts have cooled, dip in the ganache and sprinkle with the crushed candy cane. So i see a recipe for the ganache. I thought you dip into that and then sprinkle with the peppermint. I am not sure where the glaze comes in. I love following you on Instagram to see what you’re up to. Always beautiful and tasty! After the donuts have cooled, dip them into the ganache! Hope that helps! Quick question, I am from Belfius and we don’t messure in cups buts grams . Is a cup sigaret the samenamount as a cup of flour etc.? 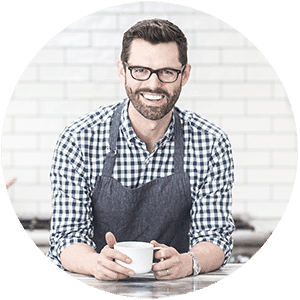 I just love Your recipes and pictures! 1 cup equals 128 grams or 5 oz! Hope that helps! Hi 🙂 Im from Hungary and i love this recipe 🙂 but i hate coffee 😭 how can it be substituted? You do not need to substitute the coffee for anything. The coffee is only added to bring out the chocolate flavors. Just make the donuts without! Hope you enjoy! hello, how much is 1/3 T of baking soda? I made them and believe I put that in but they came out flat. So sorry your donuts came out flat! Use 1/2 tbsp baking soda next time! That should do the trick!